Earlier today over on the Disney Parks Blog, Disney Cruise Line revealed a couple changes planned for the Disney Magic during her fall dry dock. The the changes announced (plus the one unannounced) are centered around the forward funnel area which saw a major change during the last dry dock with the addition of the AquaDunk. 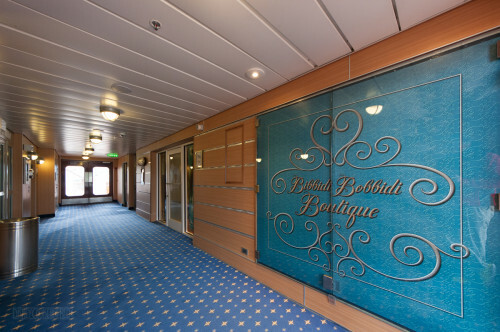 Basically, Disney announced Bibbidi Bobbidi Boutique will be added to Deck 10 which it already exists to some extent and Edge will be moving to Deck 9. For now, Disney is keeping the Concierge Lounge on Deck 10 a secret. What will happen to the void left by the Edge on deck 2 was not mentioned, but based on recent experiences an expanded guest laundry room would be beneficial enhancement. 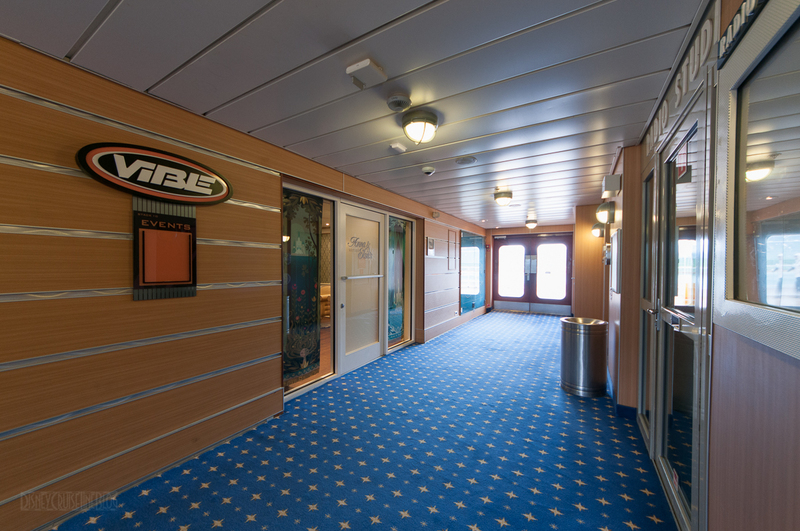 The biggest change announced today is that dungeon that is currently Edge, the tween-exclusive space on deck 2 will be relocated to Deck 9 Midship. The exact location was not revealed, but the likely casualty will be Quarter Masters Arcade. It is not unprecedented since the arcade on the Disney Dream will be repurposed later this year into Vanellope’s Sweets & Treats. The all new Edge will feature high-tech gaming stations and a dance floor. The Disney Magic will be getting a Bibbidi Bobbidi Boutique for guests ages 3 to 12 on Deck 10 Midship. In reality this is already partially completed (if not complete) as Anna & Elsa’s Boutique. The Bibbidi Bobbidi Boutique sign is up in area outside the doors which are located next to the entrance to Vibe. I believe Anna & Elsa’s boutique was available as far back as the Eastbound Transatlantic cruise with the following packages. It is unclear if this will just be rebranded during dry dock or if DCL has surprise in store. I’m thinking it will just drop the Frozen tie in or even stay the same with both names being used for true synergy and frozenication with an expanded menu of BBB and Pirate makeovers. Rumors have been swirling for some time with regard to a Concierge Lounge on the Disney Magic with area above the Cove Cafe being the location. 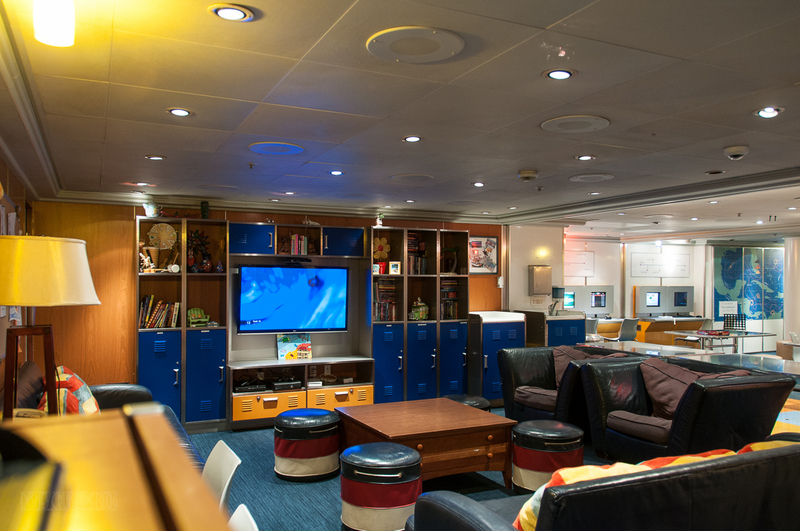 Think Outlook Café on the Disney Wonder, but exclusive to concierge guests. Just last week when I took the pictures of Anna & Elsa’s Boutique, I also captured what is currently the Radio Studio with the windows covered up. 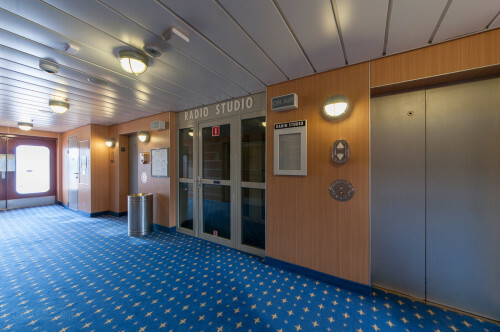 Earlier today, I had a conversation on Twitter with a guest that was also on the 11-night cruise who spoke with a representative from the concierge team who confirmed it was being added above the Cove Café on Deck 10 which would be the Radio Studio space. The only insight that was given is that the lounge would be similar to those on the Dream and Fantasy. The Disney Magic will finish her short Mediterranean season on September 5, 2015 and (presumably) head to Cadiz for a 2-week dry dock. The first guests will get to experience these enhancements beginning with the 11-Night Westbound Transatlantic Cruise from Barcelona on September 19, 2015 which will take guests to Funchal and Castaway Cay before arriving in Miami. One in Miami, the Disney Magic will sail 4-Night Bahamian cruises along with 5-Night Western Caribbean cruises through the end of January 2016. This entry was posted in Dry Dock and tagged Bibbidi Bobbidi Boutique, Cadiz, Concierge, Disney Magic, Edge, Quarter Masters Arcade by Scott Sanders. Bookmark the permalink. this is excellent info! I have to LOL about the “dungeon” comment”. My son gave me such grief for booking the Magic for Thanksgiving this year because he hates the Edge on the Magic. He will be thrilled when I let him know it will be redone. Can you please post any further info when you receive (sketches would be awesome!!). Thanks for all your efforts! I l love your blog!!! Can someone tell me what the Radio Studio is currently being used for? Cannot wait to see the new Edge! My son will be Edge age the next time we sail the Magic. This will no longer be a downgrade. I agree!!! The Edge was so gloomy on the Magic!!! I also never saw too many people in that arcade. Great use of that space!!! The walls may already be insulated to drown out the previous video machine noise. Yes, Elsa and Anna Boutique was on the May 15th EBTA. There is also that unused area above Signals Bar at the Quiet Cove Pool (which used to be Outlook Bar). That space has been empty for many years. I believe the area that the Edge currently occupies used to be conference rooms on the Magic. I have seen them use the Radio Station a few times in the past for broadcasts. Last year when the first sailing after the reimagining of the Magic happened they had tons of radio stations broadcasting from Deck 9 around the Quiet Cove Pool. Not sure if the radio station was used as well on that cruise. I think Disney Radio used it on that cruise or someone because I recall it being used as well. 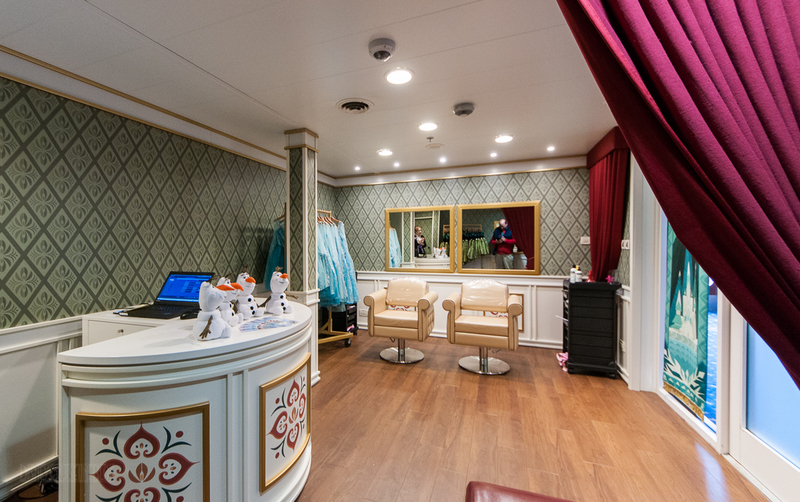 The probable addition of the Concierge Lounge on The Magic is great news for us! We’re sailing concierge on The Magic in early November. Nothing about the Lounge is coming out of the onshore concierge team. This poses another question…not sure where they could put it, but any thoughts on whether or not The Wonder will add a concierge lounge during their dry dock next year? We’re booked concierge on The Wonder Dec. 2016. Thanks for keeping us informed Scott! Your blog/website is the BEST! We were on the 2014 transatlantic. The Magic looked great, apart from two areas, the Cove Cafe and the Promenade lounge. I really hope they address these two areas as they were clearly out of place. Putting the Edge next to the “Quiet Cove” doesn’t seem too smart. There’s already an arcade where the Edge will be, don’t think that it will interfer with the quiet cove at all. But a Concierge Lounge up where they could expand the Outlook Cafe, that’s kinda heart breaking for someone who enjoys the Outlook so much on the Wonder. Especially as I wouldn’t be surprised to see them re-purpose the Deck 10 Outlook on the Wonder to match. Is there any word on changes to the Vibe or will that remain the same? Nothing was announced for Vibe. On the 22 August the arcade was closed and contractors were in situ, on disembarking the arcade machines where on the dockside. Concierge Lounge on The Wonder. 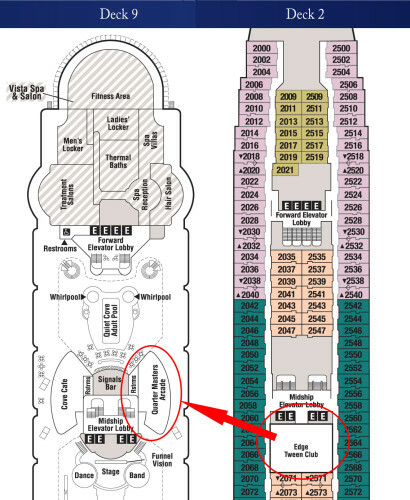 This will the 2nd time with DCL and going to get a 1 bed room in Nov 2016. will the ship be redone before then ? and have a place for the lounge ? I am trying to find a list of what you get for the price. the do ask and so on. never been in that class of rooms. The Disney Wonder is slated for a September/October 2016 dry dock. The Wonder already has the Outlook Cafe which is in the same area as the concierge lounge on the Magic.